The Most Common Uses Of Aluminum | Wrisco Industries Inc.
Aluminum is the third most abundant element. When it comes to a variety of use, no other metal can compare. It is even used in ways you never thought of such as in manufacturing glass. Recycling scraps of aluminum only takes up to 5% of the energy needed to produce new aluminum. Aluminum is used in transportation due to its unbeatable strength to weight ratio. Aluminum’s lightweight requires less force to move a vehicle. Thus, leading to better fuel efficiency. Being that it is also corrosion resistant, you eliminate the need for expensive anti-corrosion coatings. Experts are already predicting that the average aluminum used in a vehicle will increase by 60% by 2025. When a building is made with aluminum, it is virtually maintenance free. This is due to aluminum’s superior resistance to corrosion. With aluminum, you also get a pleasing finish that can be curved, cut, or welded into any shape. In addition, aluminum allows modern architects the freedom to create buildings no wood, plastic or steel could create. Aluminum may have 60% of the electrical conductivity of copper. However, its low density makes it the ideal solution for long distance power lines. Aluminum is also more ductile than copper. This means it can be formed into wires much more easily. The corrosion resistance of aluminum is what helps protect wires from electrical damage. The appearance of aluminum is why it is used so frequently in consumer goods. It gives modern tech gadgets a sleek and sophisticated appeal. Also making them light and durable. Nowadays, aluminum is replacing plastic and steel components. This is due to it being stronger and tougher than plastic while also being lighter than steel. At WRISCO, we are one of the largest aluminum suppliers across the United States. We are the aluminum experts that have been providing quality customer service for more than 100 years. 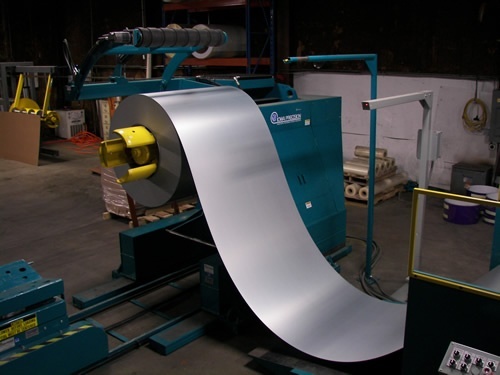 For unmatched quality Aluminum Products and Superior Services, contact us at (800) 627-2646.